Oven Baked Ribs, How To Cook Great Tasting Pork Ribs Indoor. Top 2 photos are spare ribs (side ribs). The bottom photo are back ribs. Spareribs are cut from the pork belly, same area bacon comes from. Spareribs usually have 11-14 ribs and weigh about 2-4 pounds (1-2 kg). Spareribs are meatier, fatter and little less tender than the more expensive baby back ribs which originate from the rib and center section of the pork loin. Spare ribs can be sold as a whole slab, whole ribs have a flap of meat found on the inside or bottom called the skirt and a breast bone with cartilage running along the outer edge. 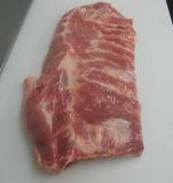 Many stores and butcher shops will remove the skirt and breast bone giving the spareribs a more rectangular look similar to the baby back ribs. 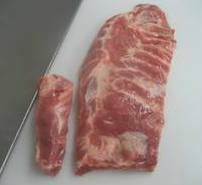 After removing the skirt and breast bone the spareribs can be marketed as St. Louis Style Ribs. 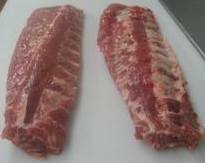 Some grocery stores will then cut the ribs length ways into 2 smaller pieces, retailing half as spare ribs center cut and the other half as spare ribs center removed. Nothing beats the tender smoky flavors of spare ribs or back ribs cooking low and slow on the grill in the summertime. Anyone who lives in an apartment with no access to a grill or if you have 3 feet of snow on the ground, you don’t have to miss out on tender great tasting ribs. You can still enjoy great tasting super tender oven baked ribs indoors. Many recipes suggest par boiling the ribs in water or adding water to the pan, we found this may speed up the cooking time a little but left the ribs dry and chewy, so we recommend do not par boil ribs in water. Enhanced or seasoned pork is becoming more and more popular in grocery stores in the United States and Canada. If the pork you have purchased is enhanced do not use a brine solution or add any salt to the recipe. Read to learn more about enhanced or seasoned pork. Ribs have a skin like membrane located on the bone side of the ribs which many debate how to cook pork ribs, whether the skin should be removed or left on prior to cooking. Some say it prevents smoke and spices from penetrating the meat and some say that removing the skin robs the ribs of flavor and moisture. We found that leaving the skin on did not interfere with the flavor but the skin left on will make the ribs a little more chewy. When cooking pork ribs in oven or cooking bbq ribs on the grill we prefer to remove the skin. On the bone side of the rib start at the small end of the slab and use a butter knife or similar tool to work up part of the skin membrane. It seems to be easier to get this started on the short bones rather than on the long bones. Grasp the membrane with a paper towel and pull it off toward the wide end of the slab. If you're careful and lucky, you'll get the membrane off in a single piece. The membrane on spare ribs may shred when pulled off, so you may have to pry up a few remaining bits and pull them off. Don't be fooled by what you see beneath the membrane you've just removed. There appears to be another layer of membrane and many people are tempted to try to remove it. You can't and you shouldn't...that material is what holds the meat and bones together. Just leave it alone. If you're having a hard time prying up the membrane, it may not be there, some prepackaged ribs have the skin already removed. 1. Remove skin, apply a dry rub on both sides at least 1 hour before cooking. To impart more flavor apply rub 2-8 hours before or overnight. 2. Let ribs sit at room temperature 30-60 minutes before cooking. Pre-heat oven to 300 degrees. Place ribs meaty side up on a rack and set rack on a shallow baking pan. If you don’t have a rack no problem, you will just have to drain some of the fat in later steps. Now wrap the entire baking pan with ribs on it in foil, this really helps to trap in the steam creating juicier ribs. Roast for 1 hour. 3. After 1 hour remove the foil and drain some of the fat using oven mitts if you are not using a rack. Return oven baked bbq rib to the oven without the foil for another hour. 4. Remove from oven, if needed remove some fat from the baking pan. Brush on your favorite barbecue sauce liberally on both sides and return the ribs to the oven for 1½ hours or until the bones have separated from the meat. 5. If you want oven baked ribs that are so tender the bones easily slide out, don’t skip this final step. Wrap each rib in foil and place the wrapped ribs in a paper bag and fold the end closed and let the ribs sit a room temperature for 1 hour. These will be the tenderest oven baked ribs you have ever eaten. Serve and enjoy. Share Your Pork Rib Recipe. Do you have favorite pork rib recipe that you would like to share with others? Share with us your favorite pork rib recipes, tips or reviews.